The Lord desires to constantly apply His death to our natural life so that His resurrection life may be manifested. “We who are alive are always being delivered unto death for Jesus’ sake that the life of Jesus also may be manifested” (2 Cor. 4:11). This is our path to New Jerusalem, the consummate manifestation of the life of Jesus. On one hand “we are being delivered unto death.” On the other hand, we have to deny our soul life and bear our cross. We cannot do this ourselves. We need to be empowered by Him. 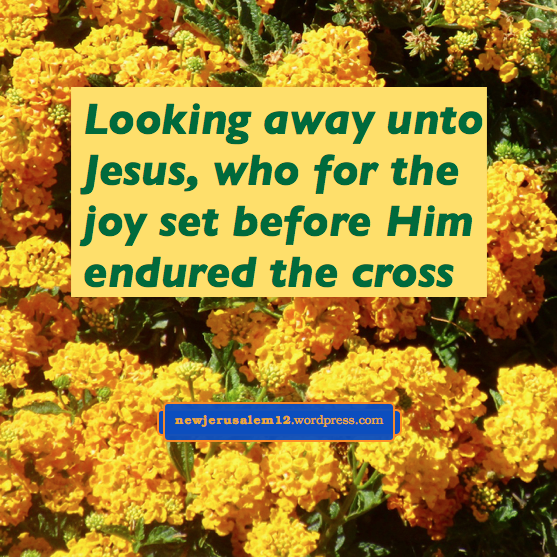 “Let us…run with endurance the race which is set before us, looking away unto Jesus, the Author and Perfecter of our faith, who for the joy set before Him endured the cross” (Heb. 12:1-2). We need the endurance of Jesus, so that we may reach the joy set before us, a joy which culminates in New Jerusalem. Thus, we look to HIm. This is similar to the first part of Romans 5. Being justified “we have obtained access by faith into this grace in which we stand.” Standing in grace, equal to looking away to Jesus, brings forth many virtues including endurance. A related verse is 2 Thessalonians 3:5, “The Lord direct your hearts into the love of God and into the endurance of Christ.” When our hearts are loving God we have endurance, but we are not the source. It is “the endurance of Christ.” He brings us through all the killing of our natural man into the reality of the new man, which becomes New Jerusalem. In the New Testament, tribulation refers to the persecution of the Lord’s people throughout this age (e.g. Matt. 24:9, Acts 14:22) and to the “great tribulation” (Matt. 24:21; Mark 13:19), the last three and a half years (Rev. 12:14) of this age, immediately prior to the Lord’s visible return. God, in His sovereignty, uses both aspects of tribulation to prepare His people for New Jerusalem. Here are more verses about this. Acts 14:22, “Establishing the souls of the disciples, exhorting them to continue in the faith and saying that through many tribulations we must enter into the kingdom of God.” This was spoken by Paul and Barnabas in caring for relatively new believers. 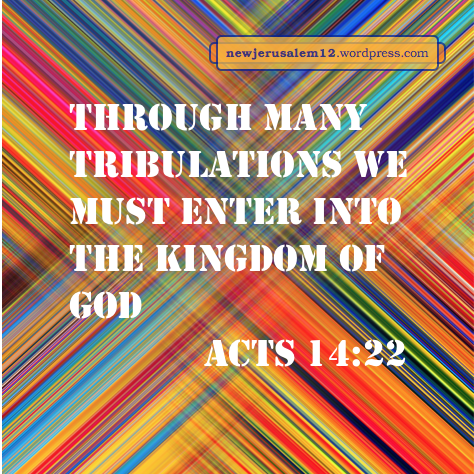 Tribulations would not be rare to them, but through these they were brought into the reality of the kingdom, which ultimately is New Jerusalem. To participate in this entrance, we must continue in the faith. Some ways to do this are to read and say amen to God’s word, to sing about our Lord, and to praise Him. Also, since Romans 8:35 promises that neither tribulation nor other difficulties can separate us from the love of Christ, we can continue by declaring, Lord Jesus, I love You. Revelation 1:9: “I John, your brother and fellow partaker in the tribulation and kingdom and endurance in Jesus, was on the island called Patmos because of the word of God and the testimony of Jesus.” John partook of the endurance in Jesus to suffer tribulation for the word and the testimony. May we follow his example. At that time John tells us that he was in the kingdom. This was the spiritual reality. Like the believers in Acts 14:22, John was still waiting for the entrance into the manifestation of the kingdom at the Lord’s return and the fullest experience of the kingdom in New Jerusalem. In the New Testament, tribulation is used in two ways. One is the general persecution and sufferings of the Lord’s people throughout this age (e.g. Matt. 24:9, Acts 14:22). The other is the “great tribulation” (Matt. 24:21; Mark 13:19), the last three and a half years (Rev. 12:14) = 42 months (Rev. 11:2) = 1260 days (Rev. 11:3) of this age, immediately prior to the Lord’s visible return. The devil is the source of all tribulation, including its hatred, persecution, and killing. But the devil “was cast into the lake of fire and brimstone” (Rev. 20:10). Hence, when the new creation and New Jerusalem appear, there will not be any devil nor any tribulation. Acts 11:19: “Those then who were scattered by the tribulation which took place on account of Stephen passed through as far as Phoenicia and Cyprus and Antioch, speaking the word…” Here tribulation spread the gospel. 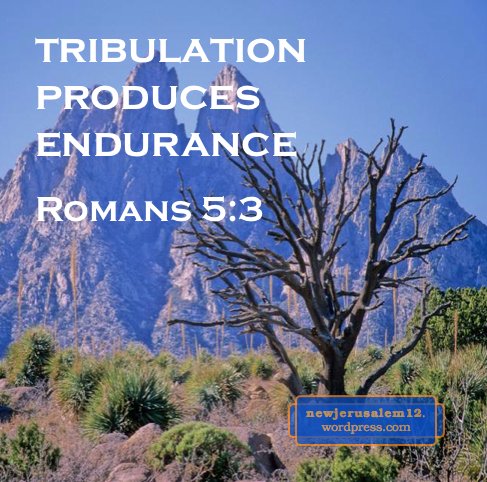 Romans 5:3: “…we also boast in our tribulations, knowing that tribulation produces endurance.” This is not our endurance; rather, it is “the endurance of Christ” worked into us (2 Thes. 3:5). Revelation 2:9-10: “I know your tribulation and poverty (but you are rich) and the slander….Do not fear the things that you are about to suffer. Behold, the devil is about to cast some of you into prison that you may be tried, and you will have tribulation for ten days. Be faithful unto death, and I will give you the crown of life.” Amazing! The crown of life, surely a characteristic of New Jerusalem, comes forth from tribulation. God has called us into His kingdom and glory (1 Thes. 2:12) to fulfill His purpose of being expressed and reigning through a corporate man (Gen. 1:26-28). Ultimately this goal is fulfilled in New Jerusalem which expresses God and is the center of His ruling in the universe. Revelation 1:6 tells us that Jesus Christ “made us a kingdom, priests to His God and Father, to Him be the glory and the might forever and ever.” Again God’s kingdom and glory are linked. Today God has made the believers His kingdom; in the future the whole earth will be. In Revelation 1:9 we read, “I John, your brother and fellow partaker in the tribulation and kingdom and endurance in Jesus, was on the island called Patmos…” The apostle John was inwardly in the kingdom while outwardly exiled to Patmos. New Jerusalem will be an open manifestation of the kingdom’s inward reality in which John was, and we are, participating. In 1:9 John does not mention glory, only tribulation and endurance. 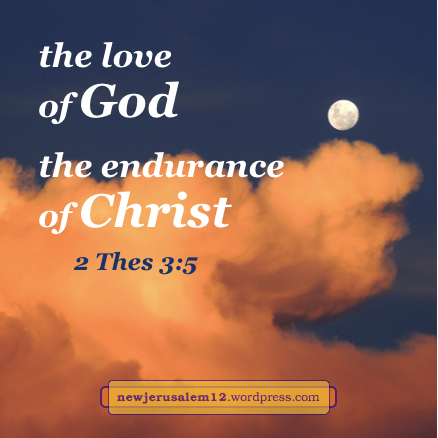 Romans, Thessalonians through Titus, and James all have multiple mentions of endurance, which is needed to hold fast our faith in tribulations. Second Thessalonians 3:5 says, “the Lord direct your hearts into the love of God and into the endurance of Christ.” Our natural endurance is not what God wants; we need to be led into the endurance of Christ. New Jerusalem will not display our natural (and fallen) virtues. Rather, it will be an exhibition of what God has imparted into us, including the love of God and the endurance of Christ. The glory of New Jerusalem will be a product of our loving God with the love He gives us and the many virtues of Christ realized by us in our living now, both in good times and in trials.